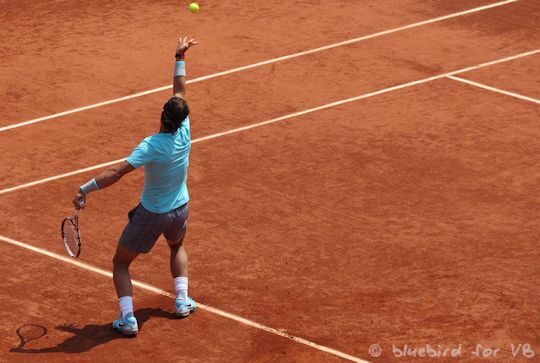 Roland Garros came up with a lot of excuses for why they chose to put the world number one and defending champion on Suzanne Lenglen court for his opening match. There was a lot of talk about giving everyone a chance to play on Chatrier, Club Presidents Day which mostly happens on Lenglen, blah, blah. Whatever. Still seemed like a nifty bit of scheduling to give him a slap in the face. Why was the other half of the draw playing first? No-one seemed to ask or answer that question. Still, in the end the weather was not as bad as feared and the first two matches rattled through pretty quickly. Rafa was playing Robby Ginepri who he'd just played once, back in 2005. Arguably, the schedulers were justified in putting this match on Suzanne Lenglen since it wasn't the most spectacular display. 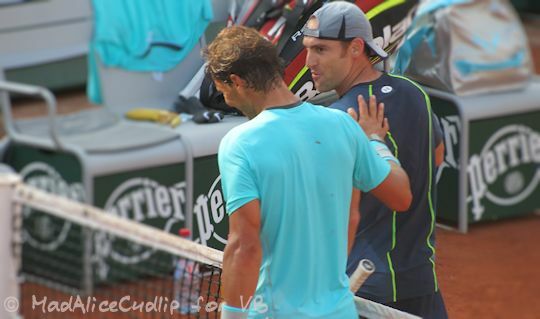 Ginepri had no weapons with which to bother Rafa and the match ended 6-0, 6-3, 6-0 in Rafa's favour in just under an hour and three-quarters. I have to admit that, after the stresses and strains of sitting through the first three rounds in Rome, it was just the sort of match I wanted to see. The rain held off and we even got a glimpse of sunshine for a few games. We had two long days to fret about his next match. This was the first time he'd played Dominic Thiem, a player around whom there was an inordinate amount of hype. He is being vaunted as the second coming, the hope of tennis and a certain future number 1. A recent victory over Stan Wawrinka in Madrid had some pundits believing he would create a sensational upset by beating Rafa. Even the more conservative of them had him getting at least one set. Pah. The reality was that, despite some very flashy passing shots, he was somewhat out of his depth. For every shot that hit the line there was one that was out or in the net. Once he can build up consistency (and maybe gain some humility) he will probably be a force to be reckoned with. Right now, though, he wasn't there and Rafa beat him pretty easily, 6-2 6-2 6-3, despite being broken once in sets one and three. I left Roland Garros after that match so Rafa was left to play Leonardo Mayer without my support. Didn't seem to bother him, though. There was a bit of a wobble in the middle but he still got a straight sets win, 6-2, 7-5, 6-2. Let's hope that all the people who clamour for autographs after every match and practice will be cheering him on with as much enthusiasm next week.